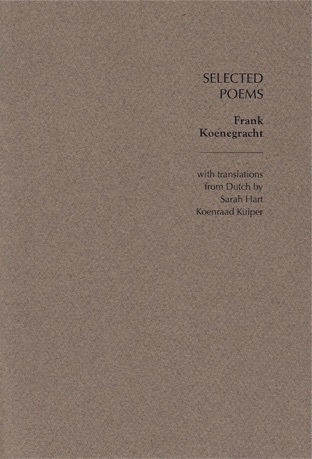 The poetry of Frank Koenegracht is mischievous, droll, & in a “world full of metaphysical teaspoons”, seriously involved in the human condition. This 21 poem bi-lingual chapbook selection from the work of “one of the best, albeit not yet best-known” Dutch poets, features translations by Netherlands-domiciled Irish writer Sarah Hart and Dutch New Zealand poet Koenraad Kuiper. Frank Koenegracht was born in Rotterdam in 1945 and studied medicine in Leiden, specialising in neurology and psychiatry. He practised as a psychiatrist for forty years, with an emphasis on mood disorders and sleep-wake disorders. He has published eight volumes of poetry with his publisher De Bezige Bij; in 2012 a new collection came out, his first in ten years. He has been awarded two poetry prizes: the Anna Blaman Prize in 1990 and the Frans Erens Prize in 2001. Sarah Hart is Irish and lives in Leiden. She has published a novel and three collections of columns from NRC-Handelsblad and Vrij Nederland. Koenraad Kuiper’s family come from Rotterdam. He has lived much of his life in New Zealand and has published four volumes of poetry as well as having poems appear in Landfall, Islands, Sport and Poetry NZ. by the same invisible madman.